Who doesn’t love lemons? It smells so refreshing, and above all, it is enriched with vitamin C. Weight loss, hair care and other health issues have been resolved using lemons. This only means that the benefits of lemon are enormous. Apart from the usual lemonade that lemon is commonly used for, what other things can lemon or its peels be used for? This is what you’re going to find out at the end of today’s post. You can remove rust from metallic substances using lemon. Just cut open 1 lemon and squeeze the juice into a cup. Top up with water and deep your rusted object into it. You can also rub the peel of the cut lemon on the rusted surface. It helps to cleanse it faster. It could be a knife, microwave, and more. You might have heard about the awesome way one can whiten the teeth with charcoal, this isn’t false. However, by just adding some drops of lemon juice, you could get it done faster. Lemon will also freshen your breath. Mix one cup of lemon with a bucket of water. Soak your stained clothing in your solution and leave it for a few hours or overnight. Don’t worry it won’t damage your clothing, lemon works nice on them and well on cotton. Although some stains may require you soaking them overnight, some may disappear in minutes depending on what stain you have on them. Do you feel your elbows are getting a bit hardened? There’s no problem, your solution is in lemons. All you have to do is mix lemon with baking soda and apply it on the spot where you feel the dryness. You can also cut lemons into equal parts and with one half, sprinkle baking soda on it and rub it gently on the dry elbow. Leave it for some 15minutes and rinse off. Yes! You read right. If you happen to be in the part of the world where I live, this should be common as many individuals have used this method in combating body odour. Cut open a lemon and rub them under your armpit. Do this 10 minutes before you hit the show daily and you’ll see tremendous chances. Lemon has an antibacterial property that can aid in making objects cleaner and bacteria free. So next time you want to clean your cutting board, rub a half cut lemon on your board to get it clean and free from bacteria and germs. After using your lemons or after squeezing out the juice, rub it on your fingernails to whiten them. Your refrigerator may have been loaded with many items that might have generated an unpleasant scent. Lemon is what you need to make your refrigerator smell differently for the day. Divide one lemon into four parts and place them at various positions and keep a lovely citrus smell all day. There is a way of removing stubborn stains from materials and items by combining lemon with vinegar. Do a 50:50 ratio of lemon and vinegar (white) and store it for 10days or a little over that covered. Use this to remove stubborn stains by rubbing sufficient amount of this solution on the stain. It could be your beautiful shirt; it will work just fine. With honey, lemon juice, yoghurt, and a pinch of salt, you can make yourself a remedy for the dead skin. Mix together all items and apply it on dead skin spots. Rub your fingers on it in a clockwise or anticlockwise direction and wait for 30minutes before you wash it off. I don’t hate insects but I don’t like them either LOL. Dry peels of oranges have been used in small towns in Ghana and other neighbouring countries as a method of driving away insect especially mosquitos and houseflies. The peels are burnt and the smoke does the magic. Lemons are no exceptions, place the peels of lemons in areas where ants and other insects or pests may invade and say goodbye to pests in your home. So what other uses of lemon do you know? Share them beneath this article, in the comment box. We could pick up a few and increase our list. 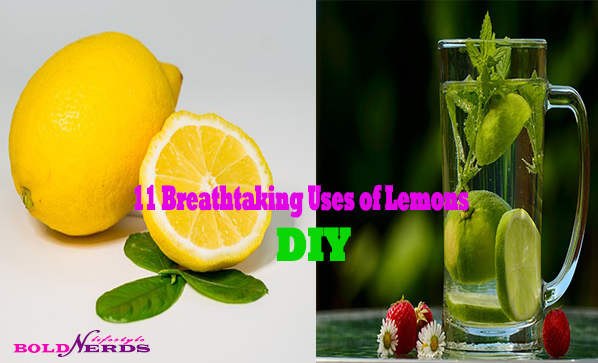 We hope you enjoyed our article on “11 Breathtaking Uses of Lemon You Never Knew”. We would love to send you periodic tips on beauty, fitness and healthy living. Don’t miss our next tip, subscribe to our newsletter below. It only takes a few seconds! Don’t worry we respect your privacy and we’ll not spam you.